L-R: Dr Nicola Reavley and Dr Lisa Brophy. 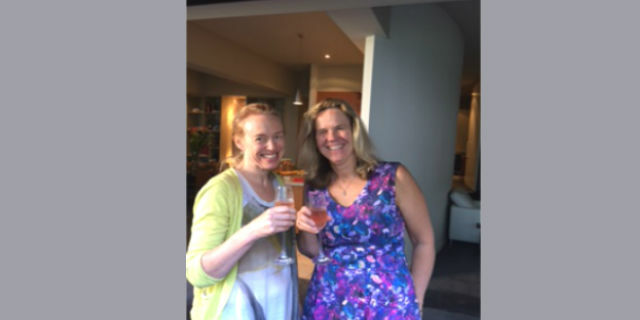 Dr Nicola Reavley and Dr Lisa Brophy from the Centre for Mental Health have recently both been promoted to Associate Professor. Nicola is an NHMRC Career Development Fellow and a Senior Research Fellow in the Population Mental Health Unit. Her research focuses on improving public knowledge and beliefs about mental health problems, reducing stigma and discrimination and particularly on interventions that aim to improve support for those with mental health problems. She is a Chief Investigator on five NHMRC-funded projects and has also led a number of projects that aiming to assist organisations to better manage mental health issues, with funding from beyondblue, the Institute for Safety, Compensation and Recovery Research (ISCRR) and Australian Rotary Health. In 2016, she was a member of the team that produced the Lancet report entitled Our Future: A Lancet Commission on Adolescent Health and Wellbeing. Lisa is the Director of Research at Mind Australia and a Senior Research Fellow in the Mental Health Policy and Practice Unit. She completed her PhD in the Department of Social Work at the University of Melbourne in 2009. Lisa’s research focus is on people experiencing mental ill health and psychosocial disability and their recovery, social inclusion and human rights. She has been involved in local and international collaborations regarding mental health law and its implications for policy, law reform and direct practice. Lisa was a member of the expert advisory group that reviewed the Victorian Mental Health Act, and a community member of the Victorian Mental Health Tribunal. Since April 2011, she has been a member of the MSPGH Human Ethics Advisory Group. Both Nicola’s and Lisa’s Associate Professorships will take effect from the 1st of January 2017.